This dynamic conference brings together 27,000 aviation industry professionals for three-days full of exciting events, more than 1,100 grand exhibitor stands, nearly 100 static aircraft displays, and dozens of education sessions and networking opportunities. Participants and guests of the conference can explore the 2 million square feet of exhibition space within The Las Vegas Convention Center (LVCC), located adjacent to the bright lights of the Las Vegas Strip. You can also expect informative industry sessions related to data security, ways to manage personnel shortages, technology driven trends, and so much more. The annual special event, Fund An Angel Cocktail Reception (formerly the NBAA/CAN Soiree) is also scheduled to take place on the evening of Wednesday October 11th from 6 p.m. – 8 p.m. at the Wynn Las Vegas Hotel. This event benefits the Corporate Angel Network (CAN) by supporting cancer patients and helping them access the best possible treatments. The reception will feature a top-shelf open bar, passed hors d’oeuvres, networking, and live and silent auctions with all proceeds going directly to the Corporate Angel Network. Again, you can find the STS Aviation Group team at Booth N3336 within the Las Vegas Convention Center. Key members from STS AeroStaff Services and STS Component Solutions will be on site to discuss all of your aviation industry requirements. 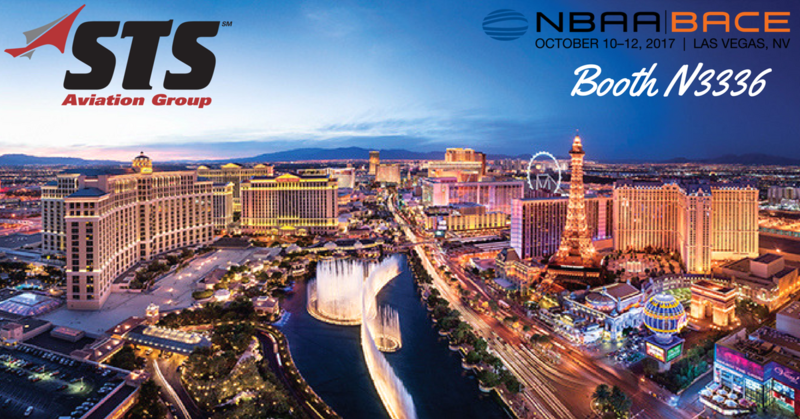 STS looks forward to once again being a part of NBAA’S Business Aviation Convention & Exhibition where airlines, suppliers, manufacturers, and other aviation industry experts connect to make critical strides within the industry. Remember to fly by booth N3336 to meet the STS team, and we really look forward to seeing you in Las Vegas!